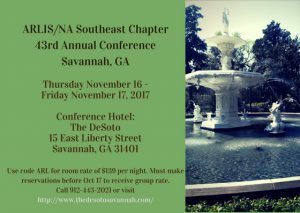 Register now for Savannah 2017! Conference dates and hotel arrangements in Savannah, GA, are firmed up for our November 2017 annual meeting. Additional information coming soon via ARLISSE-L. 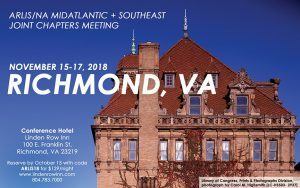 Looking forward to another great Southeast Chapter conference! 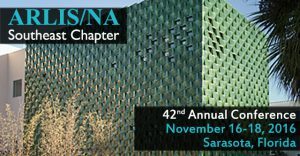 It’s not too late to register for the ARLIS/NA Southeast chapter conference in Sarasota! Submit your registration forms and payment no later than Tuesday, November 1. Find the registration form and more information on the conference activities on our 2016 Chapter Conference page. Register now for the 2016 ARLIS/NA-SE Chapter Conference! Registration for the ARLIS/NA Southeast chapter conference in Sarasota is now live! Find the form on our 2016 Chapter Conference page. Forms and payment must be postmarked no later than Friday, October 28. The ARLIS/NA Southeast Chapter is now accepting lightning round proposals for the 2016 Annual Conference, Sarasota School, which will be held in Sarasota, Florida from November 16-18.